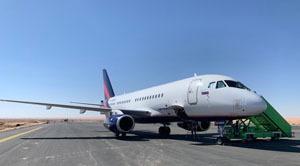 The “Sukhoi Civil Aircraft Company” presents the SSJ100 in Saudi Arabia. On 12-14 March 2019 in Riyadh at the Saudi Airshow the business version of the SSJ100 aircraft is on display. The cabin interior of the aircraft at display is designed for 19 passengers and is divided into several zones. The first and second section, intended for business meetings, are equipped with comfortable furniture, state-of-the-art multimedia systems and rotating-sliding seats. The compartment of the principal passenger is equipped with a full-scale workspace and a place for relaxation and a separate. There is a separate lavatory in the rear part of the aircraft. The service section is equipped with two cabin crew members seats, modern pantry-galley module and a lavatory for the crew and the closet for the passengers’ belongings. The business version of the SSJ100 is the kind of the aircraft that is characterized with the big passenger cabin and long range of flight and at the same time the competitive cost of the aircraft operation. Commercial operation of the SSJ100 aircraft in business version started in 2014. Currently there are nine aircraft operated in different configurations, and they perform flights both in Russia and abroad.